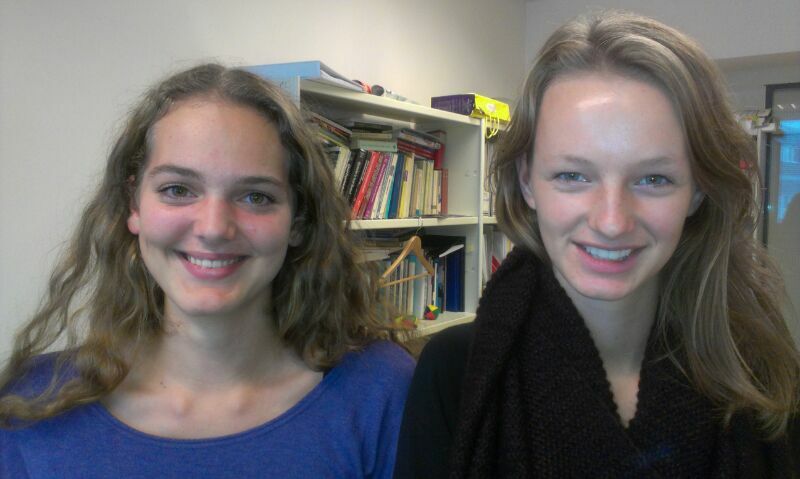 Annemijn Tops and Elsemiek Smilde, two high-school students from Amsterdam participated in one of our research projects. How did you learn about our research group? We participated in the Pre-University College at Leiden University. This is a programme for excellent high-school students in their senior years who want to be challenged a bit more. Carolien Rieffe gave the lectures for Psychology during this programme, that's how we got interested in the psychological development of children. As part of the Pre-University College programma, we were supposed to take part in research from one of the participating disciplines. Luckily, we were matched to Carolien Rieffe! We were involved in the project on emotion induction, which examines emotion arousal by means of self-report and physiology in school-aged children. Our research was about the difference between subjectively experienced and objectively measured changes in emotional state. While the children were performing tasks on a computer which are aimed to induce anger or sadness, we measured their heart rate and arterial oxygen saturation. Children also reported on any changes in emotional state that they have noticed themselves. Are you getting anything out of participating in this research project? Of course it was a great opportunity for us to be involved in this project and we learned about how scientific research is being conducted. Besides that, we wrote report on this study, which we handed in as our 'profielwerkstuk'. Because Psychology is not a subject in high school, it was our report for Biology.